I’m most excited about the new Pointe de L’Au chairlift because the ancient, slow and very long 2-person chair it’s replacing was by far the worst lift in the whole of the PDS. It was a bottleneck between Champoussin and Les Crosets, which regularly managed to create massive snake like queues even when there wasn’t that many people around. But the new high speed 4-person will make a massive difference for everyone exploring the great pistes on the Swiss side of the PDS, which are always a lot quieter than the main area between Avoriaz and Pres-la-Joux. 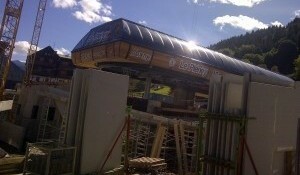 The Swiss side has now had 4 new lifts in the last 4 years; 2 in Les Crosets, 1 in Morgins last year and now this one. Along with the piste enhancements which happen along with the lifts the skiing on the Swiss side has really improved in the last few years, its’ infrastructure was poor in comparison to the French side but now it’s right up there and people should definitely spend some time exploring the area. This is main lift from Morzine village up to the slopes and regularly had a fairly decent queue as people tried to squeeze into the old style little 4-6 person bubbles. They have been very busy this year ripping out the old Telecabin stations to build new ones which will be running shiny new 10 person cabins. With an impressive capacity of 3000 persons/hr it should keep the queues to a minimum. That’s 50 people per minute which is roughly a bus full. I hope they’ve redesigned it reduce the number stairs you needed to climb, it always amazed me that whoever designed the old one it thought it would be a good idea to make everyone climb about 30 stairs at both the top and bottom stations! Why not design the lift to be a little longer so to reach the ground and let you out at the top where you need to be? Avid readers of my blog (not sure if there any 😉 ) might notice that this replacement lift was meant to be running last season, with an advertised opening of early February 2013. Well that didn’t quite happen, although it did finally open for last couple of weeks of the season in April 2013. So not many people actually got to ride last winter, but it’s there now and ready for the first day of winter 2014. Again a great improvement over the old 66 person box cable car which was OK if you happened to arrive just before it was about to depart, although my pet gripe of having stairs and an elevator to battle with didn’t help. But all too often you just missed one and had to spend 20-30 minutes waiting for the next one. 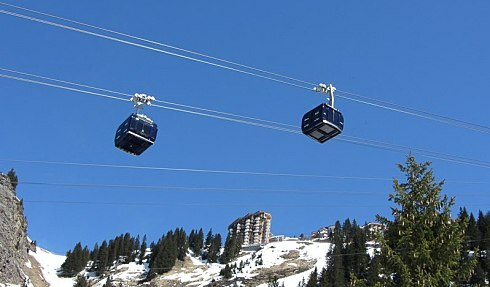 The new cable car has the latest technology which uses multiple 35 person cabins that are constantly moving round, it’s built at ground level to be almost ski on and at the top a very convenient escalator takes you a final few metres out on to the slopes. 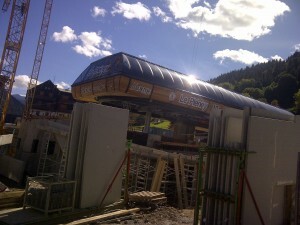 The final new development is a drag lift in the St.Jean d’Aulps area, which is designing to help people wishing to complete the Roc d’Enfer loop. 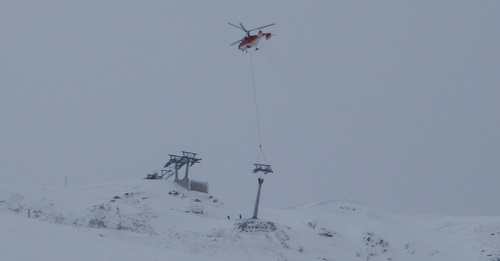 The final section of the loop down the red Follys piste was relatively flat and often had poor snow, this new lift will enable skiers to avoid this final section and join the red La Grande Terche piste back to St.Jean d’Aulps. I have to admit that despite 8 seasons in the PDS I’ve never made over to the Roc d’Enfer, it’s just too far away from Chatel! But it sounds like this is a good improvement to the area and a benefit to the PDS as a whole. This entry was posted on Monday, November 18th, 2013 at 12:08 pm and is filed under Chalet Holiday. You can follow any responses to this entry through the RSS 2.0 feed.Both comments and pings are currently closed. Absolute Alps Holidays Ski Blog is proudly powered by WordPress | Entries (RSS) and Comments (RSS).